Qatar Re said they continue on their “growth path despite unabated headwinds from tough trading conditions in global reinsurance markets, and in the first half year of 2016, the Company increased its gross written premiums to US$ 654 million, up 41% year-on-year from US$ 464 million. “The combined ratio improved to 95.8%, from 97.7% in the first half of 2015. Supported by a strong investment performance net profit surged by 79% to US$ 23.9 million in the first half of 2016, up from US$ 13.4 million for the same period in 2015,” the company said. “During the reporting period, gross premiums written have increased by 41% to US$ 654 million, compared with US$ 464 million in the first half of 2015. Net premiums earned have doubled from US$ 82.2 million to US$ 164.2 million. Qatar Re currently cedes 70% of its business via a quota share agreement to its parent Qatar Insurance Company [QIC]. “Fuelled by the strength of the Company’s long-term client and broker relationships as well as its enhanced recognition as a Bermuda Class 4 [re]insurer Qatar Re’s portfolio continued to expand in the first half of 2016. Moreover, a number of new major client relationships were successfully established, a testimony to the Company’s growing franchise. “In the European Union, Qatar Re benefited from specific project-based opportunities with clients seeking capital relief in order to comply with Solvency II requirements. Some of these transactions were made possible by the Company’s ever increasing breadth and depth of underwriting and modelling capability. “The Company’s growth is supported by the provision of capital and a parental guarantee from QIC. As at June 30th, 2016 Qatar Re’s shareholders’ equity stood at US$ 560.9 million, almost double the amount of the previous year. This capital base is supported by QIC’s shareholders’ equity of US$ 2.2 billion and a market capitalization of US$ 5.4 billion, as at June 30th, 2016. “Qatar Re’s first-half 2016 net combined ratio improved to 95.8%, compared with 97.7% in the same period of the previous year. The net loss ratio increased from 63.6% to 71.7%, reflecting above-average global catastrophe activity in the second quarter, higher net losses in facultative business where the Company is running higher deductibles and a continuing trend of prudent strengthening of prior-year loss reserves. “The increase in the net loss ratio was more than offset by a significant reduction of the administrative expense ratio, based on net premiums earned, from 31.0% in the first half of 2015 to 15.9% in the first six months of 2016. “The first half of 2015 incurred some exceptional investment cost to enable the business to grow. The results of that investment are now showing through in increased business flow and an acceleration of earnings. Based on gross written premiums, the administrative expense ratio improved to a market-beating 4.0%, versus 5.5% in the previous year. “Qatar Re’s underwriting performance is not immune to fierce and increasingly irresponsible price competition in global reinsurance markets. However, the Company’s distinct focus on knowledge-intense areas and entrepreneurial client segments has yielded a relatively low dependency on highly commoditised and competitive lines and segments of business, where business is ‘traded’ rather than underwritten. “Despite challenging conditions in global financial markets Qatar Re continues to outperform its peers, benefiting greatly from the proven investment skills of its parent QIC. Net investment income in the first half of 2016 increased by 48%, from US$ 11.5 million to US$ 17.0 million, reflecting a strong growth in investable assets. “The total annualised investment yield, including capital gains and losses, came in at 5.0% from 5.1% in the first half of 2015. During the reporting period Qatar Re’s investment performance was fuelled mainly by fixed-income securities and short term deposits. Gunther Saacke, Qatar Re’s Chief Executive Officer, commented: “Our 2016 half-year financial results testify to Qatar Re’s robust positioning in an environment of continued economic volatility and reinsurance market softness, exacerbated by above-average global catastrophe losses in the second quarter. “Qatar Re’s relative resilience reflects the increasing depth and diversification of our portfolio, with earnings from past years now coming through. 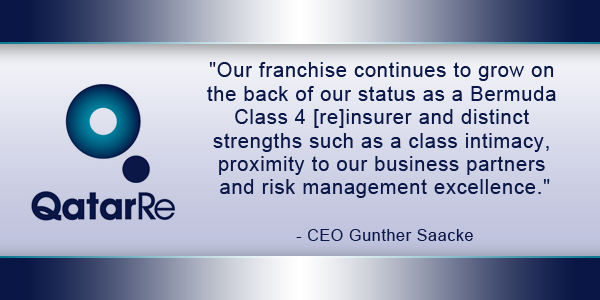 Our franchise continues to grow on the back of our status as a Bermuda Class 4 [re]insurer and distinct strengths such as a class intimacy, proximity to our business partners and risk management excellence. Mr Saacke added: “We have every reason to believe that Qatar Re’s franchise, supported by its clients and in house talent, will continue to grow. Our increasingly robust global operating platform will enable a further organic portfolio expansion. “Having said this, despite signs of a certain bottoming out of global reinsurance markets, trading conditions will remain challenging. Niches of profitable growth continue to exist, but are harder to come by. “Therefore, we anticipate and indeed will proactively ensure that the pace of Qatar Re’s expansion will moderate going forward”.